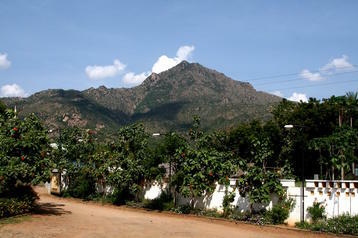 Tiruvannamalai is a slightly off-the-beaten-path temple town, with a truly magnificent temple behind which rises the sacred mountain Arunachala. 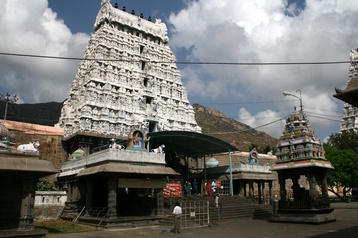 The mountain is an extinct volcano and the temple appropriately celebrates Shiva's fire aspect. 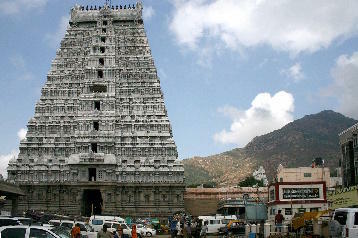 It is here where he appeared as a lingam of fire, thus proving his superiority over his rivals Brahma and Vishnu. 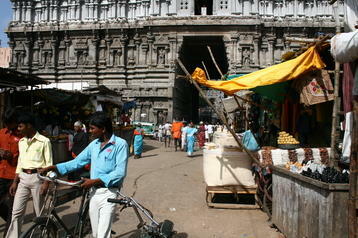 Tiruvannamalai is a smallish town and the walk around the temple and through the markets is fascinating. 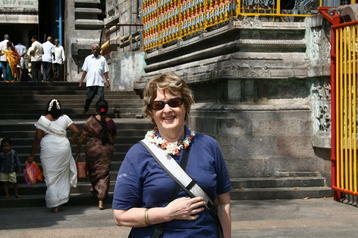 It was really one of our favorite places in Tamil Nadu, but then there were a lot of them. 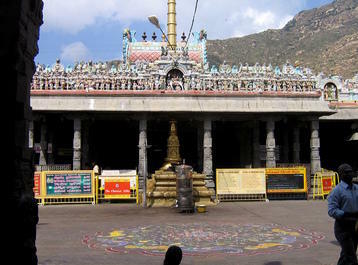 As interesting as the town is, the temple is really the center point of the visit and well worth a couple of hours. 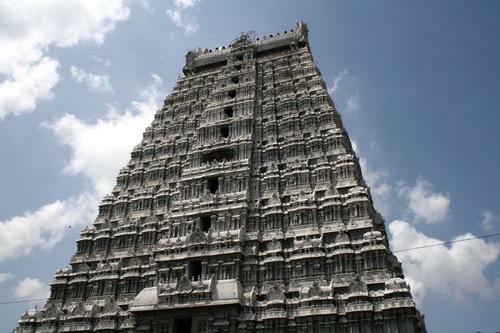 For one thing, it is the property of the Brahmins who are in charge of worship here and -- a rare thing in Indian temples -- they allow non-Hindus all the way into the inner sanctum, although photography is forbidden within the innermost court and building. 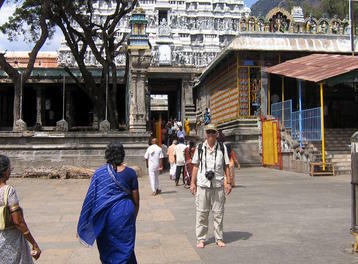 After leaving our sandals with a tender across from the temple, we entered through the soaring east gopuram into a long court with a beautiful "thousand-pillared" mandapa on the right side. 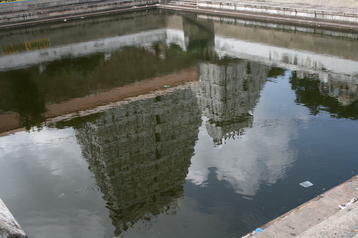 Further on to the left is a tank in which the south gopuram is reflected. Here we saw a curious ceremony. Some musicians and priests assembled in a hall to the side were preparing to descend the stairs to the court. 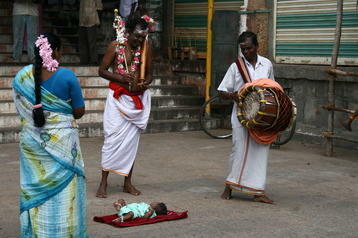 A woman hurried up with a small baby and lade it on the ground. A priest (at least, we supposed him to be so) approached, smiled broadly, then placed his foot softly on the baby, a sort of "laying on of feet". Several others did the same. We never understood what that was all about. We started to take pictures but were quickly told it was not permitted from here on -- but we didn't erase the two we had taken. We purchased tickets for the "special darshan", the accelerated viewing of the god for richer folks and tourists, allowing us to take a separate, shorter line. 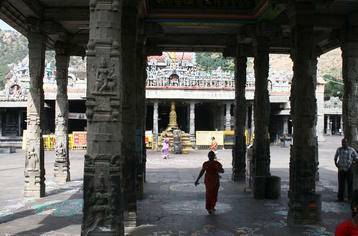 Inside the mandapa, we were a bit confused by the different paths set up by police barriers, but a couple of friendly Indian ladies took us in hand and showed us where to go. Soon we were standing right outside the inner sanctum and then we were inside. The atmosphere is difficult to describe, dark and moist and old and very warm. The very stones seemed, not greasy, certainly not clean, but somehow organic. We knew we were participating in a ceremony in a place where neither ceremony nor place had changed much in centuries, but the mysterious ambience of the small, dark cave-like room left the impression that it had been going on in the same way for millennia. It seemed to affect us both very strongly, in an almost religious way. In fact, we were in a small structure divided into an anteroom and a inner room. Looking through the opening into the inner room was like looking onto the stage of a theater. There was the lingam, tended by priests who put offerings on it and moved candles around to warm it. A priest with a golden tray holding a candle, flowers and colored incense (and a few bills to show you more were appreciated) approached us where we were standing against the back and side walls, stepping over the worshippers who were mostly seated on the stone floor. We contributed and felt the warmth from the candle as we had seen others do. 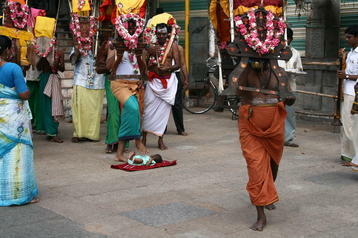 The priest then made tikka marks on our foreheads with the orange-colored spice, maybe turmeric. And we watched and smelled and heard the droaning, repeated "Om nama Shiva ya" and were almost mesmerized. Siv later said she was almost overwhelmed by it. It was certainly one of those instants where everything seems different, whole and complete. John calls this the sanctum sanctorum where Siv almost converted to Hinduism. 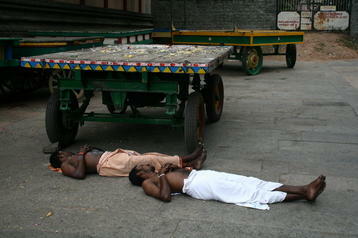 Some priests were stretched out for a nap as we were leaving. 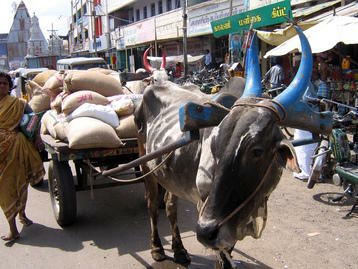 In the street outside, life went on its noisy, smelly, colorful way. Just two more pictures. We saw a blind man approaching. He wore an orange kurta so maybe he was a sage or rishi of some sort. He was being led by a young woman -- like an Indian Oedipus! The world is small. 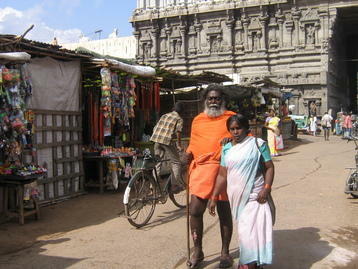 In Tiruvannamalai, John purchased his first lungi. They are really quite comfortable and practical, as it is easy to convert them from a full-length model to a shorter one. 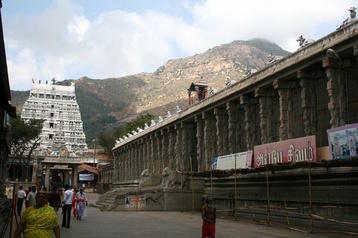 From Tiruvannamalai, we drove south-east to Chidambaram.